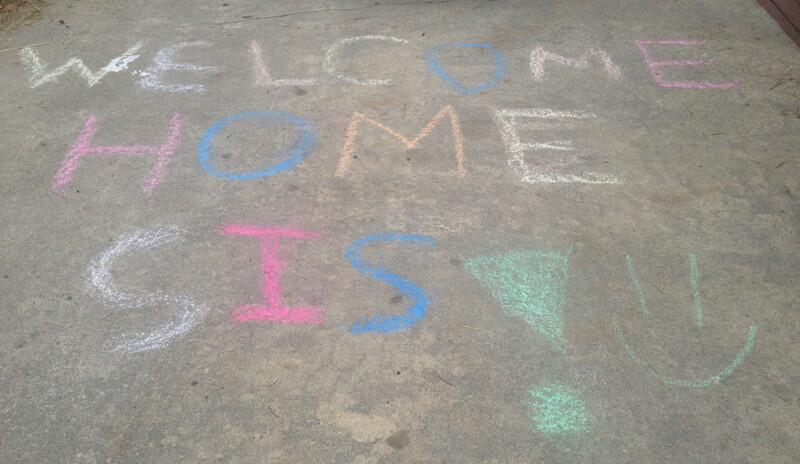 The boys and grandpa drew this on the driveway for us all to come home to yesterday. OK…so perhaps I need to back up and explain a little bit. We’ve been on this journey to foster and then adopt for around 5 years now. At least that’s when we started the training. We drug our feet a little bit in the beginning and were finally fully certified nearly 2 years ago. In the past couple of years we’ve submitted our home study for a number of kids, but nothing has come of those. We are working through an agency that works with multiple counties and my heart was kind of set on having a daughter. Truth be told, while I know others have had longer journeys, I was beginning to lose hope and get comfortable with the size of our family. Then we got a phone call last Monday. Sunday afternoon we drove several hours away to spend the week helping with a healthy transition. And yesterday, less than 2 weeks since we got that phone call, we came home with a 2 year old little girl. There is also so much I can’t share. You won’t see pictures because we’re still fostering and we can’t make those public. Same goes for her name. Unless you are part of our everyday lives and spend time with us or you are family. But she’ll be “Little Sister” for now on social media. It’s uncanny how quickly it all happened and how well we already feel like she fits into our family. She started calling us mommy and daddy Monday morning. The morning after we met her. This is such a wild adventure we are on. Holy crap. It’s been 5 years since we had a 2 year old and I kinda forget how this stage works. I’ve been quickly reminded how much work it is. We have diapers again!! While she adjusts and our boys adjust, we will be laying low and cutting as much as we can out of our lives. This will be hard for me, but important. We’re kind of a busy family so the reality is we won’t disappear, but we will be saying no a bit more and helping her get used to us cause she comes first for a while. And finally, we have high hopes that we will be her forever family as we look at the situation. But it’s a long road ahead and we know that anything could happen. No matter what, in the meantime, we are going to make her our own and love her fully. There’s a quick mind dump and update for y’all. Again, so much in our heads and so much happening that I look forward to sharing with you as we are able. In the meantime, prayers are welcomed. Wow! Finally we won’t bear the burden alone of providing female redemption for the male-rich cousin brigade at family reunions. May joy dominate this journey so that the challenges feel like the pulse of new life. Thanks for bringing this helping of grace into our world. Congratulations! You will be blessed by this little girl no matter what the outcome. It will also be amazing to observe some amazing traits in those 2 boys you’ve been lovin’ on, while they are both big Brothers. I’ll be praying for your family and for Little Sister. May she feel secure, loved, and like she’s found “home”. Thanks Lisa! She comes from a different county so I’m not totally sure how all that works, but I’m sure we’ll find out soon enough. Thanks for the prayers.